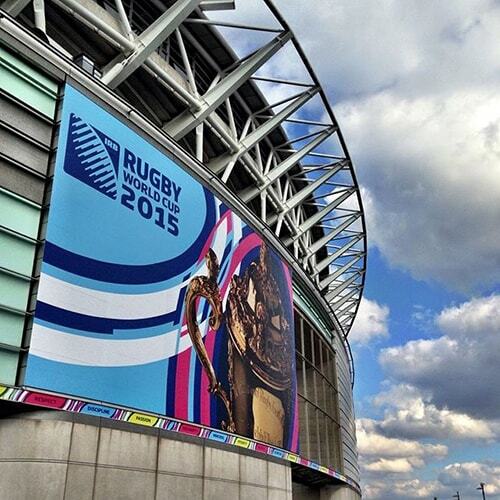 When Service Graphics was commissioned to supply exterior wall graphics for the Rugby World Cup 2015 branding project at Wembley Stadium, it asked its supplier of choice, Antalis, to suggest a suitable material. The project, which involved the production of 3,500 sq.metres of graphics in total,stipulated that all non-tournament branding had to be covered, and that the promotional graphics had to be removed quickly and easily at the end of the tournament. Accordingly, Antalis recommended that Service Graphics used Drytac’sReTac 150, a 150µ matte white polymeric PVC that is coated on one side with a pressure-sensitive, permanently peelable adhesive, which has been specifically designed for use in conjunction with solvent, eco-solvent, UV and Latex printing technologies to deliver vibrantly coloured, high quality graphics, while also offering the added advantage of being easy to apply and remove. In addition, the material has a Class 0 Fire Rating, making it the ideal choice for use in public spaces. After testing the samples that Antalis supplied, and finding the resulting output to be satisfactory in every way, Service Graphics produced everything that was required and, using a mechanical platform for installation, completed the whole project within nine days. Removal proved to be equally trouble free and, when the tournament ended, the original surfaces were once again revealed in all of their glory, without being despoiled by any sticky residue.